Cute. But too short. Makes him look like Daniel Radcliffe! Craig Parker: Cute – vs – Oh. My. Effing. Gods!! Ah heck, who am I kidding? He’s gorgeous either way! and an even lovelier smile (and incredible eyes), I prefer him with hair. Tom Hanks. Run, Forrest! – Box of chocolates. Ted Whittall: Handsome – Wow. Not saying guys with short or no hair are less attractive. Two words: Bruce Willis. I’m just saying some hairstyles really work, and some really don’t. Here’s another one, where about ten years also played its part… and my ageism is another post altogether! Thomas Anders: Long 80s hair, nein danke. Short 90s/00s hair, bitte bitte bitte sehr! TV presenter Jonathan Ross and food critic Matt Preston. I quite like Wossy anyway, but with a different haircut, perhaps less so? but with that hair, he definitely has some potential! And it’s not just the men, to be fair! I do very much prefer Morena Baccarin with long hair. I just think it suits her better. Gillian Anderson, Rachel Hurd-Wood and Karen Gillan. Their hair colours, no matter how natural they are or not, I LOVE THEM! 10 Responses to "It’s all in the hair…"
Lovely post! In the picture of ginger (?) haired Paul you don’t like, we can see Richard’s hair real colour . We “forgive” him for dyeing it black, don’t we? His dark hair makes him so much more gorgeous. BTW, I did the test, great one. I only got 60% right. 12 out of 20! Hair does make the difference. 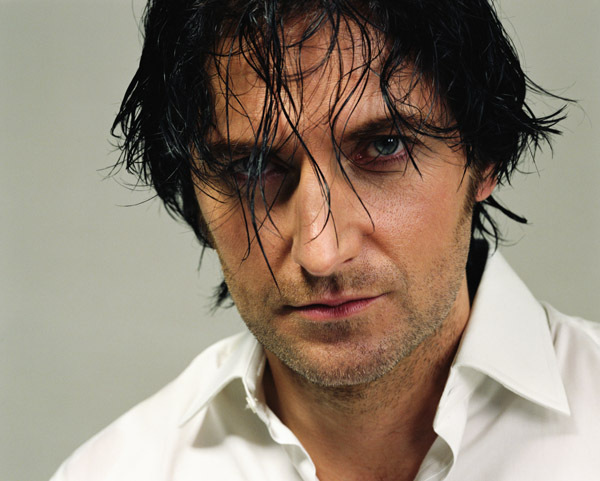 I liked RA’s long hair as Guy and Craig Parker’s long hair in the Seeker. I am a long hair girl…cant help it….it is the native in me! I agree that a too short haircut isn’t as flattering as his flowing locks, but I still like his hair in Ultimate Force, just not as much as in Spooks or Strikeback. Must be the combination of the darker hair plus the longer locks that is so devastatingly gorgeous! As an aside…I have noticed a huge difference in the looks of Canadian power ballad singer Celine Dion between hair cuts. I always thought she was pretty gorgeous (like a fairy queen) until she cut her hair very short way back when…and she looked RIDICULOUS! Really bad — from fairy queen to strange elflike creature! Sorry, had to get that off my chest, but I hope she runs away from scissors from now on! I don’t have an issue with the length of RA’s hair in that first picture, but the color does not suit. The bottom left pic…I’m stealing it! Holy Cow, the hotness therein! That middle pic of Toby is actually my desktop picture…I don’t know if it’s the little smile or the fact that he’s got a great neck (I love a guy with a great neck!) but it’s definitely worth appreciating. And by ‘appreciating’ I mean ‘Ogling’. I took that Cravat quiz, I don’t think I did as well as you! Maria: Thank you! 🙂 I wouldn’t class Paul as ginger, more like a lighter brown hair, and I know it’s his real colour. I don’t mind the colour, I just prefer his hair to be slightly longer. 😉 It would be interesting to see what he’d look like. But yes – totally forgive him for dying it! It suits him really well. Avalon: Guy of Gisborne and Darken Rahl… what a team they’d make… wow, that’s a show I’d pay to watch! phylly3: Haven’t thought about Céline Dion but looking at pictures of her now, I agree with you. Longer hair is definitely a better look for her! For me it’s all about the colour, although I do favor RH3 long locks. Perhaps we have to thank the stylist who suggested for him to go dark. So I’m not the only one who gets distracted by a hairstyle! Sometimes I feel so shallow for allowing someone’s bad haircut to put me off their performance. For instance, I haven’t yet seen Impressionists due to ‘bad’ hair of RA but do plan on seeing it at some point! Black hair and blue eyes are the best, they stand out every time. But Richard Armitage is still handsome and has a good physique, that voice is something else too.